Foods malls the world over offer the usual mix of fast food. Here in Lusaka, the local take is The Hungry Lion – look closely & see if you recognise any favourites! Talk about food in Zambia and you’ll soon come across Nshima, a staple of the region. A very thick and smooth porridge made from ground maize. It is quite similar to the Kenyan ugali and the Zimbabwean sadza. Nshima is always consumed with soups, sauces, or stews, known as ndiwo in Zambia. The most common ndiwo dishes in the country are chibwabwa and ifisashi. Smaller pieces of nshima are typically torn by hand, and used to scoop up the ndiwo dishes. I’m always one to try local foods. Nshima aside, I came across a new dish for me at the National Museum of Zambia. When we arrived, the catering staff were unloading pots and containers of food from there car. Setting up in a make shift canteen in the museum, an array of dishes was soon assembled – fried chicken, fried fish, braised beef and, for me a must try…caterpillar! Well game for anything, I asked for a portion, to which the young lady serving screwed up her face and asked “really?” . Yes really! Perhaps not a good omen. Well, suffice to say they were ummmh different. Initially rather tasteless, chewing hard (think tyre) eventually got though to the softer centre, which brought out an acrid charred aftertaste (if you look closely, you can see there eyes & mouth). I’m game for anything, but will give them a miss in the future. Tonight we’re off to Lusaka’s Club to sample the ‘aged fillets’ or such other delights. Arrived Lusaka lunch time Thursday, after long & tiring flights. Unlike Addis, which was stacked out with Ethiopian Airways planes (plane spotters paradise – Ethiopian Airways boasts a fleet modern of over 100 modern aircraft, from 737, 767, 777, 787, A350, to smaller Bombardier Q400), Lusaka looks like an outback airfield with a weary terminal more out of an old movie (think “The Wild Geese” 1978, featuring Messrs Burton, Moore, Harris et al). The only two passenger planes were our Ethiopian, plus a South African Airways – apart from some General Aviation planes, that was it (The only Zambian Airways plane evident was relegated to the outfield). The new terminal being constructed looks suitably impressive, albeit it’s going to be something of a white elephant unless there is a dramatic increase in air traffic… [Lusaka also boasts a city airport, as we discovered when a turbo prop plane whooshed very low over our hotel at 06:00 this morning making us jump out of bed – the airfield being a kilometer down the road]. Immigration was relatively straightforward, having applied online for the reintroduced Kazu Visa which gives entry to both Zambia & Zimbabwe. At $50 each, beats having to pay twice. For an African city Lusaka is definitely underwhelming… very much a low rise city with no new build business center, it’s heart is around the old rail and bus station. The hoped for Zambezi Express train is no longer. The train which used to leave on Friday night, took some 13 hours to cover 485km to Livingston, offering a more gentle option in one of its sleeping cars. We had really looked forward to that as part of trip, but instead will take the coach on Saturday (the alternative day train only leaves Tuesday or Saturday – coach is by far the quicker option). Tickets cost only Kwacha 200 or roughly £17. With front seats, should have a great view enroute! Blogging is as difficult as ever, with poor WiFi (limited) and no 4G. Perseverance is a must – all for now, next time the topic will be food related. So, farewell to England…a truly typical send off, with torrential rain giving us a soaking before we could even get to the car. Living in the the countryside has many benefits, but when your cottage is in the middle of a field, having to open & close five bar gates when it’s lashing down, is not one. One of the rare pleasures of travelling by train from Plymouth, is the GWR Pullman service, with its on board restaurant car. Whilst a tad pricey, it’s a great way of getting into holiday mode…a pre-prandial G&T smooths the way! Lunch, scallops followed by duck in a bitter orange sauce, cheese board to share, with of course, a glass of wine or two. Travelling beyond Exeter, we’ve left the rain behind – the lasting image is of fields flooded from the recent heavy rains – a far contrast of what we will be experiencing over the next six weeks travelling through Southern Africa. Tonight’s flights will take us from Heathrow to Addis Ababa in Ethiopia, before an onward flight to Lusaka, arriving lunchtime Thursday. From there, the Zambezi Express (a misnomer if ever there was) to Livingstone, before crossing into Zimbabwe and Victoria Falls to join our overlanding trip. From there, we’ll meander our way to Cape Town, before returning to Addis for a few days, followed by another few days on the beach in Zanzibar. Finally, just to sign off and wish everyone a Happy Brexit. One person who has achieved just that is Simon Fenton, the former head of the award winning social enterprise StreetWise, who left a 9 to 5 job and career, to make a new life for himself. After travelling to West Africa, he found himself in Abene (in the Casamance region of Senegal). Now settled with his partner Khady and their two children, Gulliver (4) and Alfie (2), they run the flourishing guesthouse The Little Baobab which is now a feature of Abene life. With a steady stream of guests – many of them repeat, myself included, the business has expanded from nothing to being able to accommodate up to 16 guests. Returning after two years, the traditional “terranga” (hospitality) welcome from Simon and Khady is enthusiastic. Over the obligatory bottle of Flag (one of the many Senagalise beers), I have the chance to chat to Simon about his experiences of living as a Senagalise family, customs and life in general. In the course of his time in Abene, as well as running the guesthouse, guiding tours into neighbouring Guinea Bissau and Guinea Conakry, Simon has found the time to write two books about life in Senegal as the “Accidental African”. They make for interesting tale of life as part of a Senagalise family. Far from being seen through rose tinted glasses, this a warts and all take on life in West Africa…the two books which are available through Eye Books (UK) or from Simon direct – “Squirting Milk at Chameleons” and, “Chasing Hornbills”. In the meanwhile, Alfie is running around causing mayhem, with his fingers in everything…including helping with the work of building a “rocket stove”. The rocket stove, whilst not a new concept, is a very simple means of increasing the efficiency of cooking. The stove works by increasing the heat output, by means of an L shaped pipe, which by causing an increase in the flow of air through the chimney, acts like a throttle…a bit like the way in which a blast furnace functions. This has the effect of both improving the efficiency of cooking, and also signicantly reducing the amount of fuel needed to a fraction of that normally used (charcoal). Charcoal is the principal means of cooking for the majority of families in urban West Africa (and in many other parts of the world). In addition to improving the heat generation, it also has the effect of reducing the amount of smoke generated – a major problem in many countries and the cause of numerous respiratory complaints. Whether Simon’s attempt to bring a more efficient means of cooking will be more widely adopted remains to be seen. Down at the beach, I see a familiar sight…the local herd of African cattle. Wandering along the beach at a leisurely pace, they seem completely content in their surroundings, oblivious to everyone. My second day in Abene, I take the opportunity to take a walk around the village. Down at the beach, I see a familiar sight…the local herd of African cattle. Wandering along the beach at a leisurely pace, they seem completely content in their surroundings, oblivious to everyone. Sitting on the sand (beer in hand of course), this seems a million mile’s from home, with its myriad problems…which when put in perspective, are seemingly unimportant when considering the hardships of life in West Africa. My minor irritation that despite trying to escape work, through the wonders/bane (you choose) of the internet, I am still expected to deal with queries about work – the disclaimer on my emails that I am uncontactable seemingly falling on deaf ears! Whilst the majority of people in the UK are concerned about their standard of living, worry about being paid the minimum or living wage, whilst the Government publishes meaningless statistics about who is deemed to be living in poverty, for Africans, the bleak reality is that they would all be deemed to live in poverty. For a vast number of Africans, there is no regular work, instead living hand to mouth on what work becomes available. 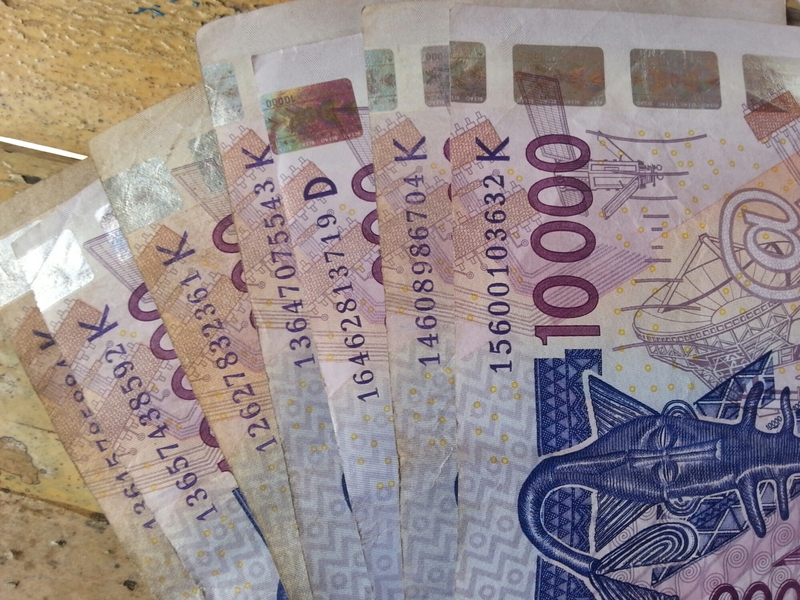 Given that a typical day rate in Senegal might only be 1,500cfa (or about £2.60), or if in a full time job 30,000 to 50,000cfa (£50 to £90) per month, it no wonder that the Toubab is seen as an easy target for extra money. The Gambia, or the Smiling Coast, favoured destination for Europeans in search of winter sun. Instead, today’s like a typical English summer…cloudy and cool. Taking the opportunity of a rest day, gives me the chance to catch up on my blog, get some clothes washed and just chill at a nearby hotel at Cape Point, Bakau. That’s if I can avoid the offers of taxi every 10 metres, offers of guides, remember me, and of course the locals telling me “Lubbly Jubbly”. What exactly is Lubbly Jubbly defeats me, as I feel the effects of ‘something I ate’…where’s the nearest loo? The hotel I’ve pitched up at to write my blog, is atypical of the type seen in The Gambia…not quite fish and chips and kiss me quick hats, but you get the idea. Mainly Germans and Dutch…not sure if the Brits have plucked up the courage to return. With the inauguration only a week away, everything appears low key. The Senagalise contingent of ECOMIG, a kilometre up the road, appear relaxed with a large number of them hanging out on the cliffs over the beach talking on their phones. Certainly happy to acknowledge and exchange a bon jour etc. Not sure how Lubbly Jubbly translates into French! In the immortal words of Baldrick, ‘I Have a Cunning Plan’ – an absolute guarantee that things will not go as planned. In the immortal words of Baldrick (for non UK readers, a character from the TV sitcom “Blackadder”), ‘I Have a Cunning Plan’ – an absolute guarantee that things will not go as planned. Having eaten half the roll and shared the rest with some kids, I finished the coffee. Being English and always taught not to litter, despite my travels, I instinctively look around for a litter bin – despite the sea of plastic that is common place in Africa…almost guiltily, I discretely drop it on a pile of rubbish. Strange mentality I know. So the plans goes something like this – I would make a one night stop over at Kaolack. Me and Kaolack have a love hate relationship following my last encounter when passing through there in 2014 enroute to Dakar. Then I described it like a Mad Max 3 town – solely on the basis of its Gare Routier, which to put it mildly, is absolute chaos and a fitting description in light of the film. I decided that I would stay at the rated budget Auberge de Kaolack, which despite its budget tag, boasted a swimming pool. Anyway, arriving at Kaolack, and after a short scooter ride, I pitch up to what was actually a rather nice hotel – but crammed full of expats. Needless to say there was no room, nor at either of the 2 sister hotels in town. Decision time…do I risk wasting another hour or so trying to find a room (the alternatives being distinctly unattractive), or make a run for The Gambia before the border closes? Cutting my losses, I head to the Gare Routier, where a giant African kindly helps me find the right car, sort ticket, and water in short order. Happy to tip him 1000cfa. Heading out, the driver gets side swiped by a truck, removing the protective grill from the rear light cluster. Bearing in mind that a sept places are beaten up old cars, with doors held on by string, barely road worthy (surely that’s a contradiction in terms), so what does it matter one further scratch? Anyway, a heated exchange follows…police…money…more heated exchanges and after a mere 50 minutes we’re off, heading to the Senegal border. After an uneventful 80 odd kms, arrive at the border, clear Senegalese formalities and “cross” into The Gambia. Immigration first…write out details in a ledger, usual question as to why you’re coming to The Gambia, occupation, etc etc. The guy then has the brass neck to ask what I had for him. Why??? So I told him I did have something for him…Advice. The advice being that he should help prevent bribery and corruption as it was bad for The Gambia. Perhaps not the wisest thing to say in the circumstances, but it suitably perplexed him and he waved me on my way to clear customs.